As Brown and I concluded our brief but voluptuous interview on his career, touring life on the road, and philosophy toward food, I broached the topics (you know I HAD to) of food, weight, and how he keeps it all in balance. 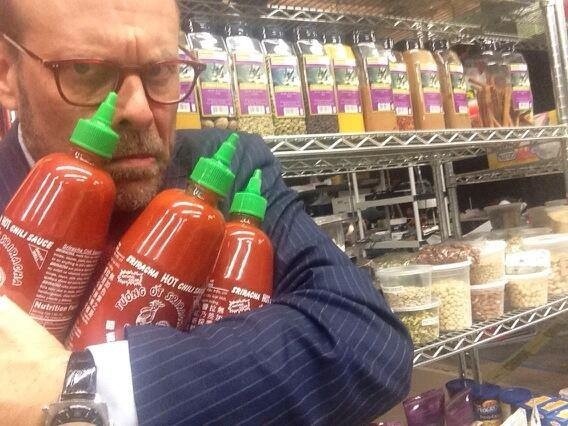 There I was last week, racing the clock, frantically trying to absorb as much information as I could about Alton Brown. I'd be interviewing him in less than an hour for a feature story on his cross-country live show, "The Edible Inevitable Tour." For those who haven't heard, Brown's tour began in October and winds down on March 2 in Sarasota, Florida. In his nearly six months on the road, the celebrity chef, TV host and author has been ricocheting around the country and dazzling live audiences with a high-voltage stage presentation that's an unusual blend of rock concert, cooking demo, stand-up comedy and science experiment. It makes a bit of sense, then, that one of the rock stars of the Food Network and Cooking Channel would be smack in the middle of a string of coast-to-coast stage performances, complete with a musical entourage and spiffed up touring bus (with a working kitchen, of course). In doing research on Brown, I read up on his transition from television commercial director to culinary school student to Food Network host. There were the starring roles in Good Eats, Iron Chef America, The Next Food Network Star, Feasting on Asphalt and other shows. There was a list of Brown's best-selling books, as well as a line of Alton-esque merchandise such as travel mugs and sweatshirts bearing his bespectacled likeness. And then I stumbled upon a completely unexpected find from his past: the reformation of Brown's eating habits that resulted in a 50-pound weight loss five years ago. I was understandably intrigued, and not just because Brown began his transformation in 2009, the same year in which my own took place. * And his personal no-fly zone, meaning never (soda, fast food, processed food). SM: "Many Americans have become unhealthy due to food choices and being sedentary... "
AB: "Let's just say the word 'fat' and call it a day." SM: "What has worked for you in keeping the weight off? It's been more than four years." AB: "Some days food is a friend and other times it's a foe. I don't really overeat anymore... sometimes when I'm nervous. But I had to learn when to stop. And it's also about being honest enough to take a good look in the mirror and say, 'Okay, we need to do a little work.'" SM: "How do you handle food out there on the road?" AB: "I set pretty harsh rules for myself when I'm on tour. We're touring in cold regions now and I can't just get off the bus and walk a few miles. I base my eating on what my body needs. I don't look at it in terms of what I can't have...but it does make sense to limit certain foods." SM: "You have foods that you never eat such as soda and fast food. I didn't see dairy on any of your lists... do you eat dairy?" AB: "I eat yogurt occasionally and like cream in my coffee, but I eat very little cheese. And I gave up drinking milk because quite frankly, it made me do bad things...it was my evil twin. Milk would whisper in my ear and say I had to have chocolate cake or cookies with it." SM: "What was the hardest thing to give up that was bad for you?" AB: "Soda. Both regular and diet. I will never ever drink it again. It was harder to quit than smoking." SM: "Besides nutrition, what else is important to you about food?" AB: "I don't ever sit by myself and eat, even on the road. I think it's important to sit and talk with people... and connect."